Despite the fact that conventionally, most people associate baldness with men, it is significantly common for women to experience hair loss also. In fact, it is thought that around 50% of women over the age of 65 will encounter a problem with hair loss. Sometimes, you may notice your hair thinning, or that you are gradually losing it over time; however, it is also possible for it to happen suddenly. 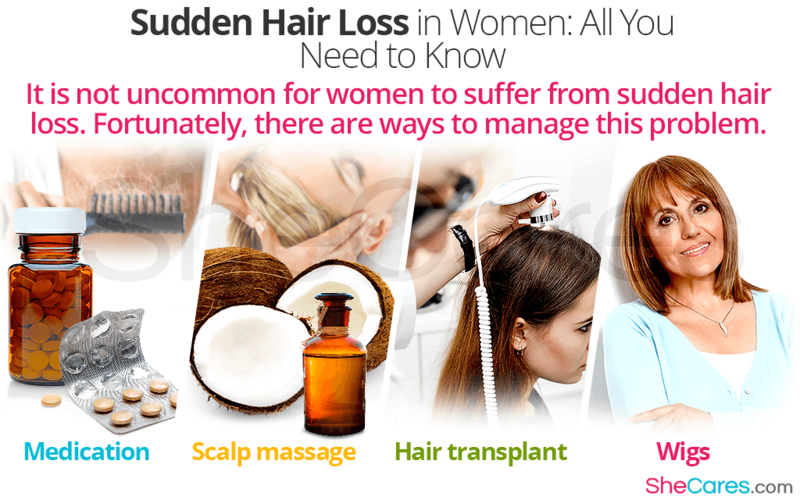 Below, find a helpful guide designed to give you a general education about everything concerning sudden loss of hair in women. Why Does Sudden Hair Loss Happen? There are several factors that can cause sudden hair loss; some of the most common include the following. At different stages of a woman's life - such as puberty, pregnancy, and menopause - her hormone levels will fluctuate. When estrogen levels fall, testosterone can dominate and cause an increased presence of one of its derivatives: dihydrotestosterone (DHT). DHT can be harmful to the health of hair follicles, and can therefore actually stop the production and growth of new hair. This type of hair loss is referred to as androgenic alopecia. Many women find that they lose hair during periods when they feel particularly anxious. Whether this is caused by emotional difficulties or by a traumatic event that the body has suffered - such as a car accident or a severe infection - it can lead to hair loss, which can become apparent suddenly, even several months later. This phenomenon is referred to as telogen effluvium. It is well known that treatments such as chemotherapy can cause rapid hair loss. This is because the procedure attacks dividing cells - whether these are cancerous or not. This unfortunately includes those in the hair follicles, again causing hair to fall out and stopping the growth of new hair. This is called anagen effluvium. Sudden Hair Loss: When to See a Doctor? Most women normally shed 50 to 100 hairs a day. This usually doesn't cause noticeable thinning of scalp hair because new hair is growing in at the same time. However, sudden hair loss occurs when the hair follicle is destroyed and replaced with scar tissue. If you notice more than usual hair loss, when combing or washing your hair seek for medical help, sudden hair loss may be related to the causes mentioned above. What Can I Do about Sudden Hair Loss? Experiencing a sudden loss of hair can be alarming and very unsettling, but there are some actions that can be taken to limit or disguise the effects and encourage regrowth. Wigs. Many women find confidence in using a wig to disguise their loss of hair. There is a huge range available, made of either real or synthetic hair, so if you decide this is the right option for you, it should be simple to find a style you like. Scalp massage. Applying oils such as coconut oil to your scalp can help to stimulate hair growth and support the health of any existing hair. It works best if warmed and massaged deeply into the scalp. Medication. It is possible to have tablets or lotion prescribed to treat hair loss, but this is not always effective. It can take several months to see any results, and in fact, the hair that might grow is likely to fall out again if you stop using the medication. Hair transplant. Although this can be an expensive option, it is possible to undergo surgery in which hair from the back or sides of your head is removed and resituated onto a patch where there is little to no hair. Sudden hair loss can be difficult to come to terms with, but understanding some of the reasons for it, as well as some of the actions you can take to address the problem, should hopefully be reassuring when faced with this undesirable issue.